At Access Denied, we are able to offer professional car key replacement in Hemel Hempstead for almost all car makes and models. So, even if you have an old classic or a brand new (and slightly unusual!) vehicle, we’re able to help. 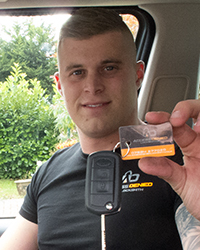 We use our experience and training to offer unmatched car key replacement in Hemel Hempstead and thanks to our unique mobile setup, we’re able to have a new key with you as soon as possible. Not only does this mean you’ll be back driving quickly, but it also keeps the disruption of your day to a minimum. If you find yourself missing a car key and in need of a replacement, contact the Access Denied team. Keeping track of your car keys isn’t always easy, especially when they tend to get lost in trouser pockets or at the bottom of handbags. In fact, even leaving them on the kitchen counter can create the opportunity for them to go missing. Losing your car keys can be a major stress. After all, how are you supposed to drive from A to B without any access to the car? Whether you need the car for work or there’s an urgent meeting you need to attend, the team at Access Denied can have a car key replacement in your hand in no time. It’ll come as no surprise that car key replacement is one of the most commonly used services at Access Denied because a large number of people misplace or lose their keys, and without a spare this leaves them in a spot of bother. Luckily, as long as you choose a professional mobile locksmith, you’ll have a replacement ready in no time. At Access Denied we’re well aware that losing a car key can cause a great deal of stress and concern, especially when there isn’t a spare and no other way to access the vehicle. However, with our mobile car key replacement services, help is never too far away. In fact, we even offer our services 24/7 and ensure we always have a stock of almost every car key on the market. Most people will lose their car keys at one point or another, it’s something that’s hard to avoid. Even if you put a lot of effort into keeping track of your keys and looking after them, they can still go missing. If your car keys are lost and you need a replacement, contact an auto locksmith in Hemel Hempstead. Keys tend to go missing at the most inconvenient of times and as well as this leaving you without access to your car, this also means you’re not able to drive to the places you need to. Whether it’s work, college or a catch up with friends you’re missing out on, this can be a huge problem. If you’re lucky enough to have a spare key this is easily solved, but many people don’t. This is where you’ll need the assistance of an auto locksmith in Hemel Hempstead. At Access Denied we offer a range of auto locksmith services, including replacement car keys and retrieving keys that have been locked inside a vehicle. Thanks to our mobile equipment we’re able to travel throughout Hemel Hempstead and the surrounding areas, meaning there’s no need for you to worry about going anywhere. When you seek the help of professional locksmiths like us, you’ll have a brand new car key in your hands in no time. As well as offering a mobile service, we also offer a 24/7 service; this means we’re able to assist you at any time of day. We understand the stress that comes with needing a new car key and therefore we like to make sure you’re not left without a key for longer than necessary. By stocking a full range of car keys for a number of makes and models, we have everything we need to create a replacement key quickly. We have helped a number of car owners over the years, all of which have had a slightly different situation. Some have had keys disappear thanks to their children and others simply lost their keys when out and about. Either way, with our top quality facilities we’re able to help. We often tell our customers to ensure they have a spare set of car keys, but not everyone listens. This can become an issue when you find yourself with missing keys and no idea what to do. When you do notice your keys are missing, it’s important to act quickly to make sure you have a replacement key as soon as possible. After all, being without car keys can cause a major problem when it comes to going about your day. Whether you’ve locked the key in your car or you’ve misplaced it entirely, you don’t need to worry. With a car locksmith in Hemel Hempstead on the way, you’ll have a replacement key in no time. As a car locksmith in Hemel Hempstead, Access Denied is able to offer a fantastic service. We strive to offer all of our clients an unmatched service comprised of great customer support, a quick response time and a professional attitude. We know that being without your car key can be stressful and we do whatever we can to fix the problem efficiently. At Access Denied, we use modern technology and top of the range mobile locksmith equipment. This allows us to work with a range of spare keys and partes, meaning we can offer auto locksmith services to almost all car models and makes. Even if you have a slightly older vehicle, we’re sure we’ll be able to help. We work 24 hours a day, 7 days a week at Access Denied to make sure we’re always available when you need us. Car keys rarely go missing at a convenient time and therefore we like to ensure we’re on call at all times. Plus, as we have a mobile setup, we’re able to travel to wherever you are regardless of location. That means we can help at home, at work or even at the local shopping centre. When you choose Access Denied, you are guaranteed a professional service from start to finish. From the moment we answer your call to the moment we’re marking the job as complete, it’s professionalism all the way. Everyone likes to think that they’re not silly enough to lock their keys in their car, but accidents happen. Locking keys in the car isn’t at all uncommon and it happens to a lot of people, especially those with children who like to mess around. However, having your keys locked in the car can become a problem if you don’t have a spare key readily available. Think about it, without access to the car you’re unable to drive anywhere. That means work, school and visiting friends is all out of the question. Luckily, Access Denied are able to help. We work hard to make sure you’re back in your car and going about your day as quickly as possible. It’s extremely stressful to realise your keys are locked in the car especially if there are people, pets or valuables inside. However, with professional car locksmiths on hand to help, this stress doesn’t need to last very long. At Access Denied we have dealt with a number of keys locked in the car in Hemel Hempstead, so we know how to solve the problem quickly. It may seem like a good idea to try and pick the car lock yourself, but we’d advise against it. Without the correct training and equipment, picking a car lock usually ends up in the car and lock becoming damaged. If your keys are locked inside the car, it’s always best to seek the help of a professional auto locksmith. Professional auto locksmiths are able to pick the lock without causing any further problems. At Access Denied we offer a 24/7 mobile service, meaning we can travel to you at any time of day. If you find yourself locked out of your car or in need of a replacement key, we’re always on hand to help. All you need to do is give us a call and we’ll be with you within 30 minutes. To find out more about Access Denied and the locksmith services we provide, get in touch. Simply contact the Access Denied team today and speak to an expert.